Choose the right goal for you, then get started! When it comes to paying for college, the earlier you begin, the better. But getting started can be overwhelming. The cost of college is rising—it’s expected to double in the next 10 years—and there’s a host of other unknowns to plan for. Public or private university? In-state or out of state? Will your child get scholarships? What about grad school? Luckily, you don’t need to know the answers to all these questions to start saving. Here are a few of the most helpful strategies for deciding how much to save for college. One of the most common ways to set a savings goal is based on the projected cost of college. It helps to start by using one of the calculators out there to help you estimate the cost of college for your child, based on factors like your child’s age, the type of school you expect your child to attend, and the expected rise in the cost of college. You should also consider whether there is a specific school that you already know your child wants to attend. Getting a little sticker shock? The good news is that whether you’re saving for in-state, out-of-state, or private, you don’t have to plan for the whole amount. Many financial advisors instead recommend saving about one-third of the cost of college, with the expectation that the rest will come from financial aid, scholarships, and current parent and/or student income (e.g., work-study). This can make the goal of saving for college feel more realistic and achievable. Let’s say for example, that your child was born in 2017 and you’re ready to start saving now (good for you!) In order to pay for ⅓ the projected cost of college, your end goal might be $73,700 for a public in-state university, $116,800 for a public, out-of-state school, and $145,100 for a private college. Is it a little too difficult to imagine the end goal, years from now? Consider walking it back to a monthly contribution amount. Just remember that how you save will make a big impact on how much you save by the time your child starts college. Many experts recommend using a 529 college savings plan, a tax-advantaged investment account that works like a Roth IRA for college. A 529 plan offers tax-free growth and withdrawals for qualified higher education expenses, which include tuition & fees, room & board, books, computers, and special education expenses. What does this mean for you? Choosing a 529 plan could mean a much lower monthly contribution since the money grows over time. 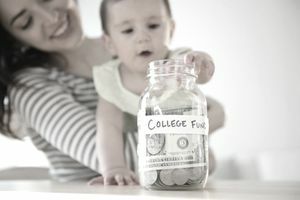 With a 529 plan, the recommended monthly contributions for a child born in 2017 would be about $165 for a public in-state school, $260 for public out-of-state, or $325 for a private university. If you intend to save using a traditional savings account or a taxed investment account, you’ll want to adjust your monthly contribution accordingly. For example, the current average interest rate on savings accounts is 0.06 percent APY. At that rate, in a savings account, you’d need to contribute about $300 per month for 18 years to pay for 1/3 the projected cost of a public, in-state college, around $500 for out-of-state, and around $600 per month for a private university. Nearly double the required savings compared to a 529! Using a taxed investment account can yield significantly better returns on your savings. With an average 7 percent return, a monthly contribution of about $190 would cover the projected cost of a public in-state university, $300 for out-of-state, or about $390 for a private college. However, you will miss out on the 529 plan’s tax exemptions on dividends and gains. Lastly, you can set a monthly savings goal for college based on what your family can afford. It is a good approach if there’s not much wiggle room in your budget. Of course, what’s affordable will vary widely from one family to the next. If you’re not sure what’s doable for your family, try breaking it down using the Lumina Foundation’s Rule of 10 formula. Discretionary income is typically defined as total after-tax income, minus all minimal survival expenses such as food, medicine, housing, utilities, insurance, transportation, etc. The Lumina Foundation states that for the purposes of these benchmarks, any income above 200 percent of the federal poverty level is “discretionary.” For a family of 4 in 2017, that would be any income over $49,200. Following this formula, a family making an average of $100,000 annually might save 10 percent of the remaining $50,800, or $423 a month. Over 10 years, that’s nearly $51,000 saved for college. With a student working 10 hours a week for 50 weeks per year at the current $7.25 minimum wage, that’s an additional $3,625, for a total contribution of $14,500 over 4 years. Of course, if your income increases or decreases, your contributions can be adjusted accordingly. And you can always make this methodology go farther by using a tax-advantaged savings tool to grow your money over time. For example, if a family with an 8-year-old child began saving $423 month in a 529 savings plan, that amount could grow to $75,300 in 10 years. It would be enough to cover the ⅓ of costs that experts recommend for a public-out-of-state school, or about ½ the cost of an in-state university. While it’s easy to get sticker shock from skyrocketing college costs, remember that the amount you need to save is likely much lower. The important thing is to start as early as possible and to be consistent with saving. However, if your child is older, don’t panic—you can still save a significant amount in a shorter timeframe. Financial aid, scholarships, student work, your income while your child is attending college, and contributions from family can all help to make up the rest.